Iran's external debts decreased by $10 billion in the past Iranian calendar year, which ended on March 20, IRNA quoted Iran's Central Bank Governor Mahmoud Bahmani as saying on Sunday. The external debts stood at $7.2 billion compared with $17.3 billion in the year which ended in March 2012, he added. He put the liquidity growth rate at 30.8 percent in the past year and said that liquidity decreased by 1.9 percent in the first Iranian calendar month compared with the last month of the past year. 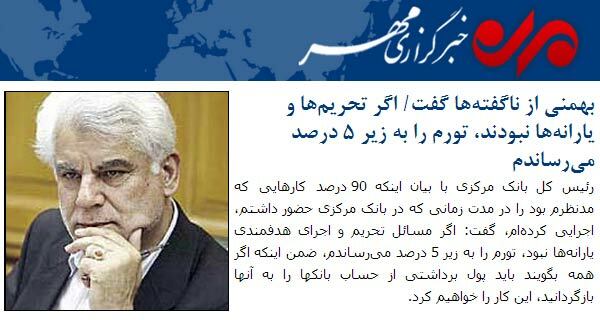 Meanwhile, Bahmani said that nothing more can be done to curb inflation, the Tasnim News Agency reported. "The [inflation] rate is very high. But, what can we do? We did our best to reduce the inflation, but that was all we could do," he said. Last year, the central bank paid 1.956 trillion rials (about $155 million) in financial facilities, 31.7 percent of which was paid to the production and industry sector, he noted. Previously, Bahmani said that the country hopes to curb inflation through taking three financial policies. Through selling bonds and gold coins, as well as through reducing liquidity, we hoped to curb inflation, Mehr quoted Bahmani as saying. Iran's inflation rate reached 38.7 percent in the first month of the current Iranian calendar year (March 21-April 20). Inflation in Iran amounted to 25.4 percent on the average during the past Iranian calendar year.